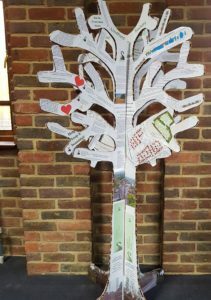 The Society entered a decorated “tree” in the Community Orchard project organised by the Arts Festival in autumn 2018. It certainly was not the most artistic effort, but we believe it represented what the Society was all about – involvement in planning applications that are detrimental to the look and feel of the village. Our aim is to promote and encourage the sympathetic development of the village and preserve the trees and hedgerows surrounding it.